I'm dedicated to helping all makers have a happy and sane Holiday season…but I know it's extra-hard if you're sick, tired or sad. Not only do you struggle to have the energy to do all the things, you might also be feeling guilt or disappointment about not being able to do everything you want to. Today I'm happy to bring you the perspective of a Starship Captain who has been there, and helps others get through it. Vanessa Laven was diagnosed with cancer in September of 2010, and as she shares in our conversation below, she was going through the worst of the chemo during that holiday season. The key to making the most of the season, no matter how you're feeling. The key to sanity is in getting it allll out of your head and into a plan. 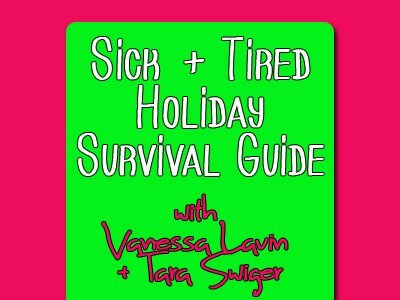 The Holiday Sanity Kit helps you do just that, along with a community of supportive Sanity Seekers, and a four week e-course to keep you on track. Find it all here. I built a beautiful Starship. I was in love with it and excited and could not wait to tell everyone about it. I had grand plans for a fabulous online-birthday party for myself. I was going to announce a really great gift (for you!) and then spend all the next week writing about what the Starship is like on the inside. And then I fell off the edge of my world. I took 2 days off for my birthday (fun! yay!) and then I got ridiculously sick. And the worst part was: I had no energy. No will. I had NO desire to write, to help, to celebrate the Starship. No desire to do anything. And I'm still not back yet. I'm still stuffy and fluffy-headed. I still don't have my excitement back. I know it's part of the cycle. The Starship help me remembers that. I miss being excited about the Starship. I miss feeling like myself. I just wanted to crawl out of my nest of blankets and tell you that if you fell overboard, or if you're tired, or if you're just not excited right now: It's ok.
Rest, drink water, take your time. And when it does, I'll see you here. PS. I am feeling well enough (and the stirrings of excitement) about our FIRST call in the Starship, Wednesday at 3pm EST. In case you missed the excitements over the Starship, you may want to beam up before the call.